They have all been on trial for a few games, but Lewis Barr, Andrew Forbes and Craig Hume are now officially Berwick Rangers players. The trio, who Harvey had a working relationship with at East of Scotland League side Penicuik Athletic, were announced late on Monday evening. 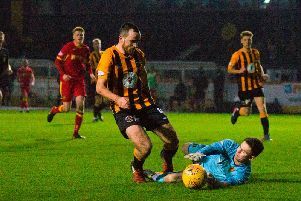 Hume and Barr both played and scored at Borough Briggs in the 4-2 victory over Elgin City which ignited the manager's reign - Barr, a midfielder, scored a tenacious goal, stealing the ball off of ex-Celtic striker Craig Beattie to slot home, whilst Hume nodded in from a Paul Willis free-kick. Barr was back on the scoresheet against Clyde this weekend, bagging a brace and winning the man of the match award. Forbes, also a defender, played at Broadwood too. Harvey is delighted to get the three tied down. Speaking to the Berwickshire News after Saturday's 3-3 draw with Clyde, he said: "I thought they all did well, they certainly haven't done themselves any harm." 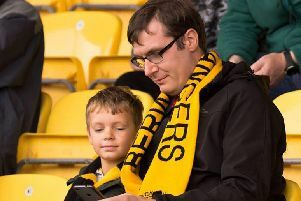 And, right enough, contracts have now been signed, with Harvey telling the club website: "“I am absolutely delighted to finally have these three boys tied down. "These are three players I have a great amount of trust in, they have worked under me for a number of years now and they know the demands of playing in my teams. "They have shown over the last few weeks as trialists they have the quality to make a difference to our team. All three players are expected to be in the squad for Saturday's match at home against high-flying Peterhead. Andrew Forbes (centre, celebrating with number nine) is also a centre-half, and has also scored already - against Clyde at the weekend.